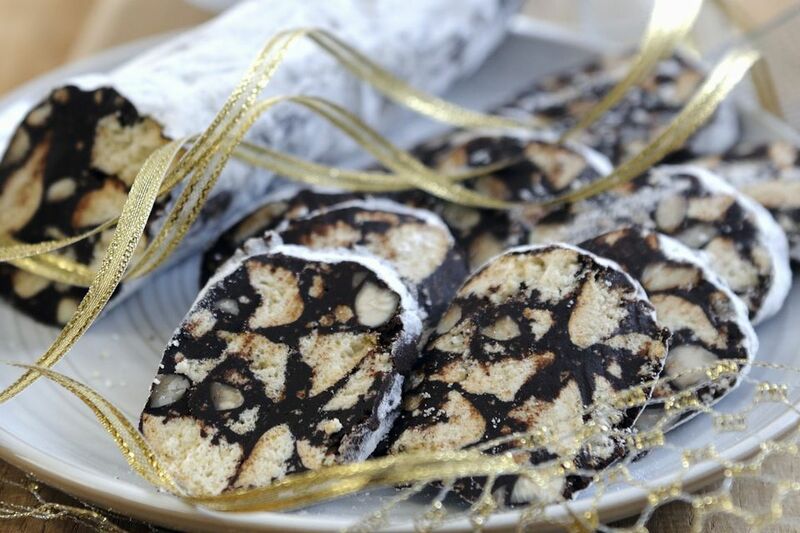 Salam de Biscuiti, or unbaked cookies made to look like slices of salami, are popular at Christmas time in Romania and elsewhere throughout Europe, especially Italy, Germany, and Hungary whose cuisines have influenced Romanian food. Essentially it is a combination of cocoa powder, butter, sugar, rum extract, or other real liquor, crumbled cookies, and usually Turkish delight. Some recipes call for whole eggs or egg yolks but, because this cookie isn't baked, make sure to use pasteurized eggs. The mixture is formed into a log shape, refrigerated, and then sliced and served. There are many variations of this recipe, and here is my favorite. In a large saucepan, heat milk with Turkish delight until candy starts to melt and reduce in size. Remove from the heat. To the saucepan, add 1/2 of the cocoa, 1/2 of the biscuits, 1/2 of the walnuts, and half of the rum. Mix thoroughly and set aside. In a separate bowl, mix the softened butter with 5 tablespoons confectioners' sugar and 2 egg yolks. Add this to the ingredients in the saucepan and mix thoroughly. Add in the rest of the rum, cocoa, biscuits, walnuts, and the coarsely chopped sour cherries. Whip the egg whites until they form stiff peaks and blend into the mixture. Sprinkle remaining 1 tablespoon confectioners' sugar and shredded coconut on a large piece of plastic wrap. Put the dough in the middle and roll it up in the plastic wrap, forming it into the shape of a salami. Wrap tightly and refrigerate 6 to 7 hours. Remove plastic wrap and cut into 1/2" slices when ready to serve.